Will Doombots Be Unleashed in Fantastic Four? With production scheduled to begin later this month on director Josh Trank's The Fantastic Four reboot, more details are starting to surface. 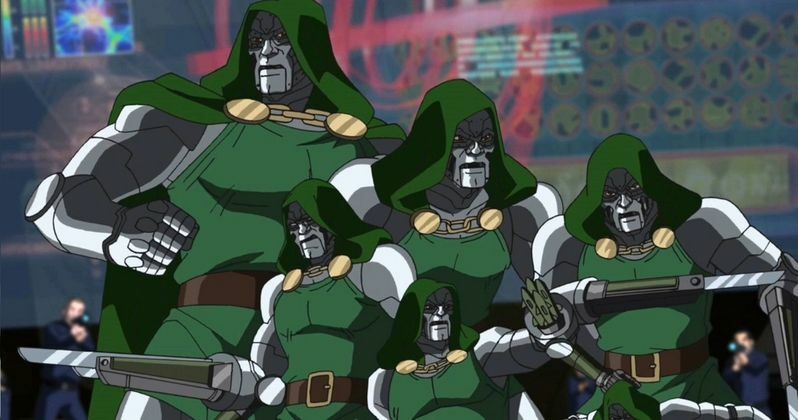 Nerdist's Jessica Chobot is reporting that Toby Kebbell's Doctor Doom will also enlist the help of the DoomBots in this upcoming reboot. "Doombots will definitely be in the film, in the form of drones that the good Doctor controls telekinetically." 20th Century Fox has not confirmed the news at this time. The DoomBots were introduced in Fantastic Four #5 back in 1965, exact, robotic duplicates of this villain that he used either to do battle with these Marvel Superheroes, or to stand in for him in situations he couldn't be there for in person. The Doombots have taken various forms in the comics, so it remains to be seen how they will be used in the movie. Toby Kebbell, who joined the cast earlier this week, stars alongside Michael B. Jordan (Johnny Storm/The Human Torch), Miles Teller (Reed Richards/Mr. Fantastic), Kate Mara (Sue Storm/The Invisible Girl) and Jamie Bell (Ben Grimm/The Thing).